Apartment Karina is located in the heart of Budva. Near the beach, the old town, the shopping center and the market where you can buy fresh seafood, vegetables, fruits, local wine and cheeses. The apartment is furnished and equipped in a modern style and the perfect blend of quality, comfort, good service, favorable price and excellent location. The apartment has a beautiful see view of the bay of Budva and the old town. 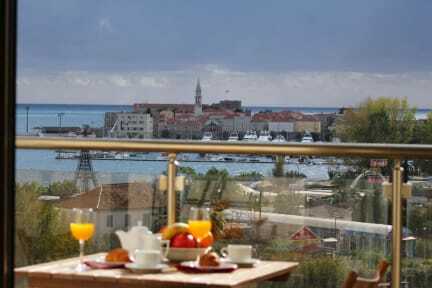 Apartment Karina is located in the center of the tourist capital of Montenegro. The apartment has a beautiful see view of the bay of Budva and the old town. If you are coming to Budva to attend a conference or congress, it is only a 10 minute to drive from the Hotel Splendid Spa Resort, Hotel Queen of Montenegro and only 5 minutes to walk from the Hotel Avala Resort&Villas. In the area of 150 m around you, you can find supermarkets, the shopping centre, the green market, restaurants, banks, a pharmacy, the post office and the public parking. Beach Slovenska plaza – 0,1 km. Karina Apartment is 45 m2. 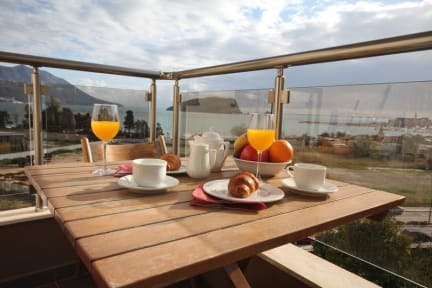 The apartment has an equipped terrace with a sea view, a living room, a bedroom, an air condition and a free wireless Internet a kitchen with a dishwasher, a bathroom with a washing machine, is fitted out with the modern furniture, Italian ceramics, cable TV. We have tried to create the unique comfort and modern design for enjoyment of our guests. -Air-conditioning, heating: the apartment is air-conditioned. -Wi-Fi Internet: Wi-Fi internet is available everywhere in the apartment. -TV: the apartment is equipped with LCD TV. -Fully equipped kitchen: as an integral part of the living room. -Fridge and dishwasher: as an integral part of the kitchen. Taxes not included - occupancy tax 1.0 EUR per person per night. We Suggest That You Print Your Booking Confirmation.